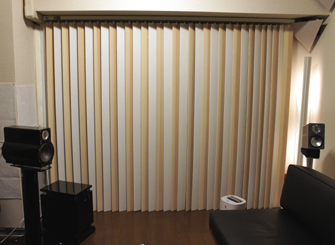 We make blinds and screen partitions in Japan. Felt is used on the louvers of this vertical blind. It is the same material used to absorb the noise in an automobile. Requiring no major installation work, the sound quality is noticeably improved. 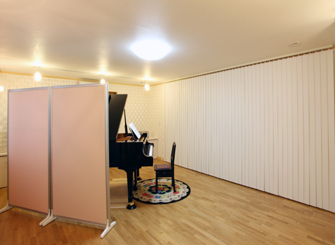 With application of surface covering, Feltone blind may be enjoyed not just sound absorbent, but also as very attractive brightness controller in a room. 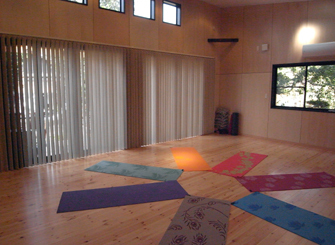 It's an ideal noise measure in a retail or a room where children gather or to enjoy music. 2012 (c) TOKYO BLINDS COMPANY LIMITED. All Rights Reserved.